If you just have to get cool with the help of an air conditioner this summer, boost the efficiency of your A/C by using a programmable thermostat to set the time the air conditioner turns on, turn the temperature up 4° and use fans to help move the cold air through your home. 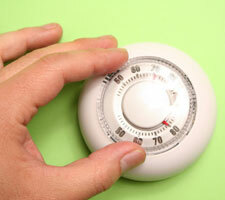 Keep lamps, tv’s and other heat-emitting appliances away from the thermostat. Changing the air filter regularly on your unit, and making sure heating and cooling ducts in your home are properly sealed are additional energy savers. Keep blinds and drapes closed during the day to reduce solar heat in your home. If possible, install white window shades, drapes, or blinds to reflect heat away from the house. With these simple adjustments you can save about 2,000 pounds of carbon dioxide per year. If you’re investing in a new AC unit, consider buying an Energy Saver model which can save 20% more energy than a standard model.